This unique crocus blooms in fall, not spring! The beautiful lavender blooms add a wonderful accent to the fall landscape. This low-maintenance plant is highly prized for its golden stigma which is used to add color and flavor to foods. 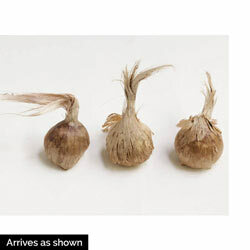 Flower Form: Each bulb produces on flower with three stigmas. 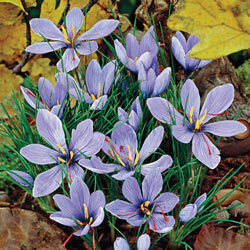 Planting Instructions: Plant in well drained soil 3-5" deep and 6" apart. Soil Requirements: Well drained soil. Additional Information: The stigmas are used as a seasoning agent in cooking.